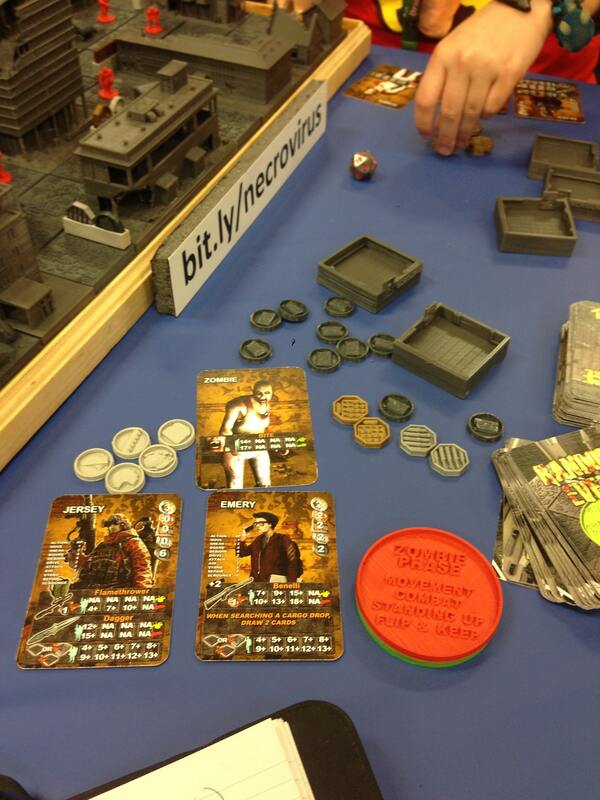 NecroVirus is the most exciting thing I saw at Gen Con. Period. Nothing else even came close. 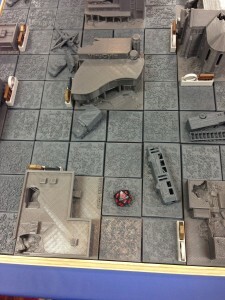 While this post is a review of the game “NecroVirus” it also is my ecstatic report of what I see as the future business model of tabletop gaming, 3D printing. I ran across NecroVirus whilst window shopping in the Playtest area and had to try it. Why? Because it has, as they say, shelf appeal. The board is huge and as you may notice, completely 3d printed (more on that later). NecroVirus the game is an “escape the city” zombie apocalypse game with each player running a group of survivors. Here is my crew in a building looking for resources (those are the grey and brown tokens to the left of the miniatures. 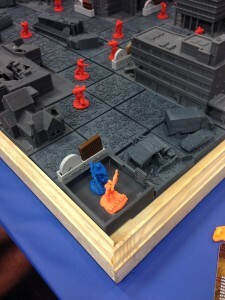 There is a building in that location, but it is removed and the “PC placeholder tray” replaces it so the miniatures can stay on the board and visible. Also, red miniatures are flesh-tearing zombies, so best to avoid them. Players move around the field gathering resources, killing zombies and occasionally finding another PC. The zombies move towards the closest “detected” player (detected status comes from searching, firing noisy weapons or other “dinner is ready” activities) every turn. Carnage ensues. A deck of cards provides random events and equipment and adds to the chaos. We played an entire game and I won because I got my survivors into the church (the scenario victory condition). One aspect of the game I did not like and hope they remove was that all of my LIVING survivors had to get in the church the same turn. Little Suzie was a bit slow, so to win I used a flamethrower to make her a former survivor. Yes, I had to kill one of my own party for the rest to win the game. Strangely appropriate for a zombie game. Necrovirus is fun, but is not different enough from the plethora of other zombie survival games on the market for me to buy into it. That said, Boardcraft.com the company running the kickstarter is the most disruptive thing I have seen in the gaming industry in 30 years. 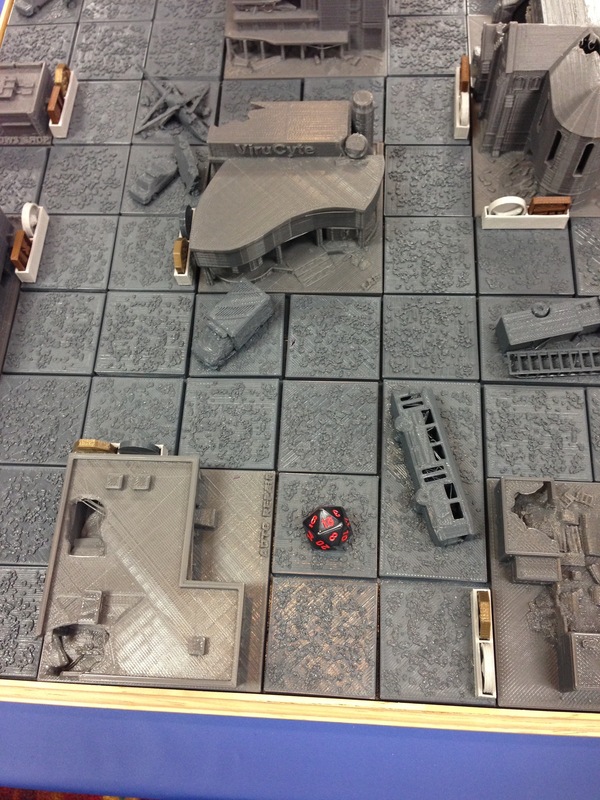 NecroVirus as a game is nothing earth-shattering in its originality, but I played it completely on components printed on a 3D printer, even the miniatures. Yes, they are still a bit crude, but I suggest you look at the rate that 3d printing matures. In a few years the quality will be orders of magnitude better and the printers cheaper. Boardcraft.com is the first company that I came across that is pushing the development of board games away from the incredibly costly model of design/CAD/print and assemble in a distant land with no environmental controls and ship back to America on a slow boat from China. I have attended the GAMA Trade Show multiple times, spoken with board game developers going through this process and I will state this with out a shred of doubt. It is painful, expensive, high-risk (Chinese manufacturers produce crap quality, steal your money or give you moldy wooden meeples are all first-hand stories I ran across at GAMA) and a massive barrier to entry. Large game companies have a Chinese-speaker, often local to their manufacturing facility to oversee their orders. Small start-ups have to cross their fingers and pray. Did I mention you have to put the money all upfront with no guarantee you will sell a single copy? There is a reason kickstarter is so popular with board game designers. 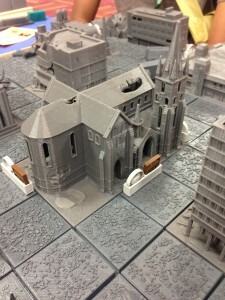 Boardcraft.com plans to offers a designer the ability to submit CAD drawings and then gamers choose to download the game (for a fee, of course) and print it on their home 3d printer. Before you say,” I do not have a 3d printer!” take the long view. Home Depot sells 3d printers, so anyone arguing that they are the realm of “hackers” is delusional. Expensive, yes, for now. Rare, yes, for now. Think about the growth of cell phones over the past 15 years. Useful tech will adopt at a rate faster than you can imagine. This assumes you buy a 3d printer and do not rent time on one at the local print shop. There are multiple companies working on units that can handle metal and multiple plastic colors. I see disruption in the game community on an unprecedented scale. Initially miniature games and terrain makers will take advantage of the printing revolution( Games Workshop better evolve because their business model is on life support), but even more “standard” board games will take advantage. There is absolutely no reason you could not make your own “Settlers of Catan” board or print out the latest set of “Carcassonne” tiles. 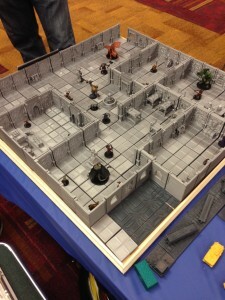 I am an RPG player and have long sought a way to make cost-effective terrain. Home Depot almost got my money for a printer when I saw this fantasy dungeon setup demo that Boardcraft made for display purposes. More important than these applications is what 3d printing allows; risk. CAD drawings require skill, but significantly less investment than publishing a traditional boxed board game. Many game designers will publish their CAD drawings and rules. Many of terrible quality, but the marketplace will sort that out and the best offerings will thrive. I am truly excited to see what grows from the “print at home technology” in the next few years and boardcraft.com is taking the first step. Back us Today time is running out!